While I always try to get nutrients from food whenever possible, there are some supplements I take regularly. One of those supplements is probiotics. Probiotics are important for gut health (and overall health) and many of us don’t get enough of them. Getting them naturally is much harder than it used to be since we have to wash produce (chemicals!) and may not eat as many fermented foods as our ancestors did. Probiotic benefits run the gamut from gut health to mental health and truly deserve their place on my short list of daily supplements. There are some commonly asked questions about them though that I thought I’d try to address in this post. Probiotics are beneficial bacteria that the human body naturally houses in the digestive tract. Mounting research shows that the body’s microbiome plays a delicate and important role in overall health. You can get probiotics in supplement form or from eating fermented foods. Both sources of probiotics have their place. Do They ( Really) Work? It depends. Taking a generic probiotics supplement while eating a standard American diet may not give you the benefits you’re looking for. Probiotics aren’t a miracle cure and need to be part of a healthy lifestyle to fully reap their benefits. This is because the kind of probiotics you take as well as the diet you eat play a big part in how well they will work or not work. Another thing to think about: probiotics come in many different species, genuses, and strains. And as we discuss below they’re not all equal. Some probiotics that work well for one thing are useless for another. That’s why tailoring your probiotics to your needs is important. Probiotic Uses: How Do Probiotics Work? The gut microbiome is a complicated place. Hippocrates was once quoted for saying “all disease begins in the gut.” It turns out he was right, and science is finding that poor gut health is related to many diseases. Bacteria (good and bad) outnumber human cells in the body ten to one. It’s thought that as much as three-quarters of the immune system resides in the gut where these bacteria live. It would make sense then that bacteria play a large part in immune function and overall health. Crowd out bad bacteria – Probiotics take over space and resources that some bad bacteria would be using. Secrete beneficial substances – Probiotics secrete substances that control the microbiome. These beneficial substances include hydrogen peroxide (H2O2). H2O2 kills bad bacteria but feeds good bacteria. Activate the immune system – Probiotics encourage the immune system to have a reaction to pathogens. Probiotics activate macrophages, natural killer (NK) cells, and antigen-specific cytotoxic T-lymphocytes. Probiotics obviously play a big part in the health of the gut and body. This is why making sure we have enough good bacteria in our bodies is so important. There are a lot of misunderstandings about probiotics and their role in health. Here are some of the biggest myths and misconceptions (and the truth!). lactobacillus acidophilus – Supports overall digestive health, nutrient absorption, immune health and urinary and vaginal health. It can also give relief from occasional digestive upset. lactobacillus plantarum – Produces hydrogen peroxide which helps fight bacteria. lactobacillus fermentum – Effective for overall digestive health and detoxification. lactobacillus rhamnosus – Research shows this strain is helpful for traveler’s diarrhea and vaginal health. lactobacillus salivarius – Colonizes in less than ideal conditions and can boost immune function. lactobacillus paracasei – Beneficial for liver health. lactobacillus gasseri – Helps support vaginal and digestive health. lactobacillus reuteri – colonizes the intestines and oral cavity and is beneficial for digestive, oral, and immune health. Bifidobacterium bifidum – Important for assisting with digestion and nutrient absorption. Bifidobacterium infantis – Babies have the largest population of this strain that declines with age. Helpful for digestive support. Bifidobacterium longum – Helps scavenge and neutralize toxins and improve immunity. bacillus coagulans – Produces enzymes that assist with digestion and nutrient assimilation. bacillus subtilis – Stimulates the immune system. bacillus clausii – Helps avoid recurrent respiratory infections in children. bacillus indicus HU36 – Proven immune stimulant, crowds out intestinal pathogens, and supplies gastric stable carotenoids. Also proven safe and stable. saccharomyces boulardii – Treats digestive illness like diarrhea and diseases that include crohn’s disease and ulcerative colitis. streptococcus salivarius – Beneficial for oral health. Also, strains that are proven effective for one ailment won’t necessarily help with another. For example, Lactobacillus rhamnosus GG is great at preventing side effects from antibiotic use. It doesn’t help with urinary tract infections though, according to Probiotic Advisor. Additionally, some strains of bifidobacterium are helpful in fighting irritable bowel syndrome (IBS). They are not helpful in treating antibiotic-associated diarrhea and other side effects. Essentially, the only way to know if one strain will be effective for a given ailment is to conduct studies to find out. The best way to find probiotic strains that will help you is to do research and find clinical studies that show a probiotic strain is beneficial for that ailment. New research published in the journal Cell shows that probiotics are not always beneficial as commonly thought. 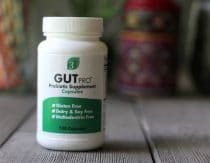 This study found that while probiotic supplements colonized some study participants’ guts, others seemed to be resistant to it. That means the bacteria didn’t colonize the gut for some reason. What researchers concluded was that it may be more beneficial to tailor probiotics supplements based on strains that are already colonized in an individual’s gut. While this conclusion is reasonable, I also wonder what the participants’ diets looked like. Diet can affect how bacteria colonize in the gut. Health is not compartmentalized. If we aren’t healthy in one area (diet for example) it’s hard to achieve health in another. Additionally, a study performed by the same researchers found something interesting. Participants who used probiotics after antibiotics actually took longer to recolonize their beneficial bacteria. Researchers conclude that the study was small and needs more research. But their research illustrates how important individualized probiotics are. Research as to the safety of probiotics is lacking as well. While most people don’t experience any adverse effects, some do. Experts can’t say definitively that probiotics are harmless for everyone. Bottom Line: Commonly, probiotics have been thought to be beneficial (or at least harmless). This new research shows that taking a probiotic arbitrarily may have no benefit and may even be harmful. It also shows how important it is to know what kind of probiotics can help a particular health issue and how to best get that strain. Fermented foods may be a better bet for daily probiotics and supplements may be a better choice for specific ailments. In either case, it may be most beneficial to consult a healthcare provider first. While the above study implies that you can’t take antibiotics and probiotics together, research shows that you can. According to one 2012 study, taking probiotics alongside antibiotics can reduce antibiotic-associated side effects (like diarrhea). It’s commonly thought that probiotics should be taken on an empty stomach but research doesn’t support this myth. Research shows that probiotics should be taken within 30 minutes of a meal. Doing this (as well as eating enough fat!) improves the survivability of the probiotic strain. It makes sense too if we think about it. In nature, we get probiotics from food (either fermented or from veggies straight out of the soil). When we take probiotics on an empty stomach they have to fight the digestive tract alone. When we talk about probiotics we often use the word “recolonize” which means to add good bacteria in hopes they will populate the gut. But probiotic supplements don’t recolonize indefinitely. They don’t stick around in the gut for longer than a few weeks. This is why it’s important to make probiotics a routine part of your day. However, according to an article published in The Atlantic, certain strains stick around as long as six months. What researchers found was that patients with similar strains of a bacterium already present in their body won’t be colonized by the supplement. In essence, strains that are similar compete for the same nutrients and the “outsider” is more likely to lose that battle. What researchers concluded was that probiotic supplements need to be tailored to individuals. To keep beneficial bacteria in the gut we need to get as many different strains as possible and take them regularly. Knowing how integral bacteria is to the gut, it makes sense that digestive system issues could crop up if gut bacteria were out of balance. Research supports this theory. A 2012 meta-analysis found that probiotics are beneficial for gastrointestinal illnesses such as ulcerative colitis, Crohn’s disease, and diarrhea. Another meta-analysis found that probiotics were beneficial for diarrhea and infectious diarrhea, including antibiotics resistant diarrhea. Many other studies have found that probiotics are helpful in treating a variety of gastrointestinal symptoms. Keep in mind though, each study has tested a specific strain of probiotics. That means other strains may not be as effective as the one tested. Getting the right strain for your ailment is important. Shift digestive patterns – Pain and anxiety are often the results of this change. Influence the expression of genes – May turn on or off the gene for depression, for example. A review published in Biological Psychology further discusses the link between the gut and the Brain. It concludes that the gut-brain axis along with inflammation can affect mental health. Probiotics may play a part in anxiety, depression, and other psychiatric illnesses. Another study published in the EPMA journal found that probiotics have an anti-inflammatory property that can be beneficial in treating diseases that have an inflammation component. Mental illness, as well as metabolic disease and many other illnesses, have a connection to inflammation. Probiotics may help with weight loss too. Probiotics can help the body produce the satiety hormone GLP-1, according to a 2013 study. Participants in the study had less weight gain and insulin resistance. They also had a reduced appetite and improved glucose tolerance. Another study published in PLoS One shows that probiotics can be helpful for weight loss in another way. A healthier gut microbiome was found to increase levels of the protein ANGPTL4 (a central player in fat storage). But it’s important to remember that not all probiotics are going to be beneficial. For example, Lactobacillus acidophilus may actually cause weight gain, a meta-analysis points out. Probiotics can also be beneficial for metabolic issues. A review found that probiotics help regulate blood pressure by improving cholesterol levels, triglycerides, and other lipids that are associated with heart disease. Probiotics also lowered insulin resistance and improved renin (a protein that helps regulate blood pressure) levels. While weight loss is often a big sticking point for women, there are other ways in which women, specifically, can benefit from probiotics. Can help relieve urinary tract infections (UTIs) – A study published in the journal Clinical Infectious Diseases found that probiotic suppositories were helpful in reducing recurrent UTIs. Can help fight vaginal infections – Only 40 percent of participants in a study had normal vaginal flora as the study began. Supplementation with probiotics improved vaginal gut flora so that 90 percent of the women in the study had normal flora. Can boost fertility. Studies show that fertility can be improved by addressing vaginal bacteria imbalance, according to Naturopathic Doctor News and Review. It’s clear that a healthy microbiome can positively affect women in a number of ways. It was once thought that a baby’s gut was sterile until they were born. There’s now some research that shows this may not be true and babies may be introduced to bacteria through the amniotic fluid. Babies are further colonized when they’re born. Ideally, they’re born vaginally and are colonized with Mom’s (healthy) vaginal bacteria. Babies born via cesarean section have a tougher time being colonized by beneficial bacteria and are often colonized by mom’s skin or other bacteria in the operating room. In reality, many of us don’t have healthy microbiome to pass on to our babies, whether they are born vaginally or not. After birth, babies continue to be colonized by breastmilk if they are breastfed. Ideally, mom will have friendly bacteria to pass into the breast milk (again, many of us do not). Babies fed formula may not get these additional beneficial bacteria as many infant formulas don’t include probiotics (but you can add them to homemade formula). But adding probiotics to babies and children’s daily regime can make a big difference. In studies, probiotics can be helpful in treating these issues. For infants, improving mom’s diet if she is breastfeeding is a good start. If formula feeding, adding a supplement can help. Probiotics are beneficial even before baby is born. As one review found, there are significant health benefits of mom taking probiotics during pregnancy. Probiotics during pregnancy helped prevent necrotizing enterocolitis (NEC), an inflammatory infection of the intestines in infants. You know that probiotics are beneficial to your health. Here are some of the best ways to get more probiotics into your family every day. My top choice for getting enough probiotics is by eating fermented foods regularly. Fermented foods like fermented dairy products, sauerkraut, and kombucha contain many more strains of beneficial bacteria than supplements do. Different fermented foods contain different strains too. If you get a variety of fermented foods into your diet, you should get a good variety of probiotic strains. Sauerkraut– The classic fermented cabbage dish. Beet Kvass– An incredibly healthy fermented drink made from beets. Kombucha– This beverage is a bit fizzy and sweet. Homemade Ginger Ale – A healthy take on ginger ale! 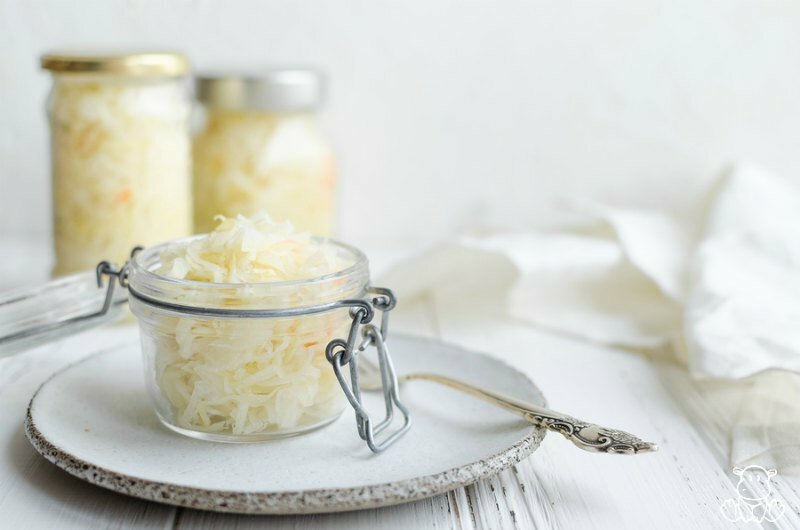 If you’re new to fermented foods, try a basic sauerkraut first. It’s easy to make and delicious. Has clinical studies (so you know they work!). Studies have shown that Just Thrive probiotics can help modulate the immune system, improve the metabolism, and heal leaky gut. 100 percent survivability – Studies prove that Just Thrive probiotics survive long enough to do their job. This is because these live microorganisms are spore-based and retain their protective shell. Stable – They are so stable they don’t need to be refrigerated. You can even cook with them up to 455 degrees! No histamine issues – Some people who are histamine intolerant can’t tolerate probiotics. Some probiotics are histamine producing. These strains include Lactobacillus casei, Lactobacillus delbrueckii, and Lactobacillus bulgaricus. Just Thrive only contains histamine degrading strains so they don’t cause histamine issues. It’s hard to tell which probiotics will be beneficial for each ailment. It’s also hard to know whether they will survive long enough to reach the intestines. So, having clinical studies available that prove the above benefits is a huge plus! There are many health benefits of probiotics but we can’t take probiotics thinking they will be a cure-all. Probiotics should be a part of an otherwise healthy lifestyle to be most effective. Additionally, probiotics should be chosen for each individual person and each individual ailment. The quality of probiotic is also important. If a probiotic doesn’t survive to reach the intestines then it’s not going to work. So that’s why I prefer fermented foods and Just Thrive supplements (which has clinical studies to support its ability to heal). Do you use probiotics? What do you use them for? Deshpande, G., Rao, S., Patole, S., & Bulsara, M. (2010, May 01). Updated Meta-analysis of Probiotics for Preventing Necrotizing Enterocolitis in Preterm Neonates. Have you heard of Digestion Plus? It’s a prebiotic, probiotic and enzyme supplement that has bacillus coagulens (patented probiotics that withstand the stomach acid and don’t get killed off by them), plus 11 digestive enzymes. I’d love to get your take on those. We have been taking them for a couple years and have good results. Any info from your perspective? 2 thumbs up for an excellent post that sheds light on a subject, found just about every where and no one seems to know the important parts. Since we have probies advertised on TV now this is a great contribution to clear confusion. $19 for an ebook? No thanks. Ridiculous. I have been coming to your site for years. I recommend you to others. But I am offended by that $19. I think you would be more offended by buying a $50+ probiotic that was basically useless, when you could have educated yourself for a mere $19! I think $19 to get the best information for my health is an absolute bargain and a no brainer! Wow, this “blog article” is just one big advertisement for an e-book. With that in mind, it’s hard to take the information here seriously. How unfortunate! Hi Kim, as you may have noticed, there are no ads on Mommypotamus. Though adding them would help cover the costs of running the site (which continue to grow as more server bandwidth is needed), I would much rather support my mission by sharing products I believe in than make you stare at a dancing banana which promises to melt belly fat. This is an ebook I believe has definite value, and I think it was very generous of Melanie to essentially share an entire chapter from her book. If it doesn’t sound like it’s for you, no worries! Good info, good luck. I *might* pay up to $9 for an ebook, but absolutely no way will I pay $19. That is not market for any ebook. The photo accompanying this post makes it clear which products the author recommends. Melanie’s book is more than a list of brand recommendations, though. It contains information about which strains are beneficial for particular health objectives along with suggestions for dosage when starting out. Thanks so much for this post! I’ve just found your site and am really finding it helpful! I tried to look at specifics on your shopping list but couldn’t pull up the links. I will try again from my computer. Thanks! Wow! I know you probably won’t accept this comment, but I can’t believe the ignorance of some people! You are much more forgiving and tolerant than I am. They won’t pay $19 for an ebook that took Melanie untold hours to research and compile, but will pay $9 for a pile of crap! It boggles my mind. But I commend you for your patience and the way you so maturely handle them. I think they expect to get all of the information for free, like people don’t have to make a living. I guess they will continue on with their collective heads in the sand while the rest of us get educated for $19. First let me say that I am shocked at the negative comments about the e-book. If you think that is to much money for you to spend then don’t buy it. No comment needed just don’t buy it. Second let me say I so focused on what she was saying about the probiotics that I didn’t even notice it there was even an e-book involved. Good info thank you for posting it. And lastly let me leave you with this quote ” If you don’t have anything nice to say don’t say anything at all”. Totally agree! How do people think people make a living researching the hell out of this stuff and then sharing with those of us that it might help? Will take this over annoying ads ANY DAY. Totally agree! I loved this article and the info was exactly what I was looking for and I will be purchasing the book. Someone’s hard work and dedication towards children’s health, as well as my love for my little one, is definitely worth $19 . I find it so odd how people don’t just move along if they don’t want to buy something instead, they have to put people down. Pretty sad when it is under $20. I also did not find this a big ad. It was an informative article. It would have taken me many searches of multiple websites and lots of reading to find out the info summarized here. The thing is, I’m 36 weeks pregnant and have been diagnosed with UTI by some enterococcus sp. The infection was discovered early in pregnancy, and treated with antibiotics according to the antiobiogram. However, at about 30 weeks the germ appeared again, although in lower numbers. Could someone please explain to me how this could affect my baby? I understand that in case of UTI, there’s a risk of early delivery, but that is not the case for me, as I’m already almost at term, and the baby seems to be in no hurry. And if I should still get rid of it before I give birth, do you have any suggestions as to what natural remedies would work for this bug and still be safe to use given my condition? Please give me some piece of advice! I’m afraid my doctor is going to prescribe me another set of antibiotics, and I really don’t want them. Please help! Just happened to see your comment…. Our daughter has spina bifida with intermittent cathing needed, so I’ve learned a lot about UTIs. 🙂 I don’t know if it’s too late for this advice, but in case not, here goes! 🙂 Probiotics can actually help fight UTIs!! So personally I’d follow all the advice in this post above!! 🙂 (As long as none of the supplements are contraindicated for pregnancy.) Probiotics for you right now should also help your baby be born with a better chance of good microbiome health. Maybe ?? increased probiotics will cure the UTI? Another thing you can add is cranberry juice to help against the UTI. Also, make sure your environment/home (especially bedroom) has no mold (I know, that sounds weird). IF they insist on antibiotics, make sure they do a susceptibilities test first. This should prevent them from giving you an antibiotic that won’t kill the infection anyway and be way more harmful than good. This is my two cents. 😀 Otherwise, I don’t know the risks of just leaving it during birth, etc…. But probiotics (especially through food) can’t hurt, I don’t think! 🙂 Hopefully you are doing okay! 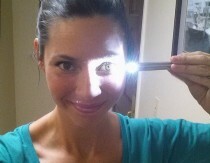 The infection could migrate to your kidneys…. You could end up with a very bad kidney infection, which you don’t want!!!!! This is probably too late for you, but perhaps someone else can be helped…homeopathic Cantharis is and excellent remedy for UTI’s and homeopathy is completely saf for anyone, even while pregnant. Google Joette Calabrese UTI for more homeopathic options. Taking a probiotic is your best option to naturally and safely remove this bacteria from your body. Wonderful information!!! Reminds me I need to try to “branch out” more…. 🙂 I am one that cannot take ANY pills because of added ingredients, processes of how they create the pills, etc., so I am glad to know Myth # 6!!!! 🙂 But, your article reminded me that I need to get out of my habit of a couple of my favorites and do ALL of them more often! If I understand correctly, different foods produce different strains of probiotics, I think? So, apple cider vinegar with bedtime snack tonight! 😀 Over all, even though my system/gut has been HORRIBLY compromised, I have had excellent results with just probiotic foods. I am very grateful. Though I do wish I could be more specific with strains. Do you think varying foods will help this (cider vinegar/fermented ketchup, saur kraut, fermented pickles, cultured herb drinks, yogurt, ginger ale, etc.)? Also, you probably already know this, but herbicides kill good gut bacteria. I am EXTREMELY sensitive to all chemicals, and when accidentally around herbicides one time (helicopter spraying on railroad tracks), I got so sick I was nearly vomiting. What cured it–probiotic foods!!! 🙂 Took getting away from the herbicide and about 12 hours of probiotic drinks and yogurt, but I was able to eat after that. Quite an experience. So thankful I knew the connection. Again, thanks for the post! -home made yogurt or sour milk ( just put raw milk in a jar and keep it warm) . Ok for kefir ( I don’t have it). In plus, these have not only probiotic bacterias, but tones of vitamins. One comment: the salt with additives can block the fermentation.. we use a row salt, from a local mine. Our family didn’t visit any pharmacy in the last 5 yeas, we checked the doctor once per year, I donate blood 4 times per year, every doctor is satisfied. I don’t know where to start! Please help get me started on probiotics! Which brand? What foods? How do I prepare them? Do you have any opinion about probiotic brands that claim to kill Candida, like probio5 through plexus? Does the ebook include brands like klarelabs? I want to take the best for myself as well as my children and starting the research is very stressful and overwhelming! I would pay $19 for a book or e a book that can save me some steps!! The ebook does make some brand recommendations – most of which can be purchased directly and a few that are available through practitioners. The link doesn’t work for me. Goes to a new website but it is blank. Tried my laptop and phone. Hi Heather, I’ve been researching probiotics extensively before choosing a brand for my LO, and stumbled across the topic of myths / misconceptions – of which there seem to be plenty! What do you think of these myths here? http://www.optibacprobiotics.co.uk/live-cultures/probiotic-myths written by a company, so likely pushing their own agenda. but they are heavily referenced with studies. Interestingly some are spot on with yours, and others, not! Would love to hear your thoughts, thanks for your time in advance. So I’m testing out a probiotic we use for potency by placing it in 4oz of milk on the counter for 24-48hrs and see if it turns into yogurt or curdles. But someone I know who works at a vitamin place said that some probiotics won’t work in this test because they’re freeze dried and the probiotics that are freeze dried don’t react til it touches your bile. Is this true or is this a load of crap? I feel like this is a load of crap. Hi. I got UTIs before. It always happened every month for 1 year and then my friend recommended this bentilia pasta. It has guts and controls bacteria, may it be good or bad bacteria. Bentilia is made of 100% lentil and bean pasta and it eliminates bad calories. You should try it because aside from it is delicious it is healthy as well. I got so sick I was nearly vomiting. What cured it–probiotic foods!!! ? Took getting away from the herbicide and about 12 hours of probiotic drinks and yogurt, but I was able to eat after that. Quite an experience. So thankful I knew the connection. Again, thanks for the post! Which kind of yoghurt ? What probiotic would you prefer that they sell on Amazon? Is this one safe for children? Probiotics are a must for our diets. I’m trying to get most of them from natural sources but sometimes supplements help as well. It’s a good thing that I read this article. The topic is very timely. There are some misconceptions about taking probiotics. Now that you mentioned some information on when to take this, people will not get confused. I know it sounds expensive for an e-book BUT I bought it last year and it was a lifesaver knowing what probiotics to give my kids with specific issues. Worth every penny!!! Every time I give my 2 year old son Gut pro he gets mean and in a bad mood plus a yeast rash behind his legs, bum, and abdomen. He has horrible candida so I’m trying to get it under control but it seems like he can’t tolerate probiotics. Any idea on what to do? Fermented foods, good probiotic supplements and even organic apple cider vinegar.